Breast cancer in its early stages is a highly curable disease, but by the time it becomes clinical apparent via a palpable lump, the prognosis is often poor. For early detection of breast cancer, mammography has been proven to be the screening modality of choice. This x-ray technique uses very low dose x-rays for imaging of the breasts. Abnormalities can be detected and investigated. All women over the age of 40 should have a biannual mammogram and over the age of 50 should have one annually. In women with radiographically dense breast tissue, some limitations in detecting some abnormalities have been noted with the traditional film mammography screening. Digital mammography including tomosynthesis is performed at both our Mediclinic Vergelegen and Mediclinic Stellenbosch branches. Up to 50% dosage reduction for patient due to shorter exposure time. Highest possible image quality and due to magnifying options to view masses, micro calcifications. Previous digital images and reports obtained quickly for comparison. 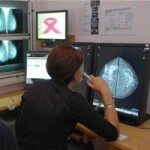 Increased demand of mammography met as more mammograms can be done due to faster imaging process. Excellent patient comfort and convenience due to unique features which focuses on each individual.